Third party call monitoring by Sage Advantage works with you to create a customized program that best meets your needs and exceeds your expectations. Third party call monitoring, based out of Scottsdale and Phoenix, Arizona, is one way companies can ensure their customer experience is top notch, while also reducing the cost of managing quality. With horror stories often making the news rounds about poor service, companies know the importance of a strong call center to help handle their customer’s inquiries. But, it can often be time consuming and costly for you to monitor your own center. Not to mention pulling and reviewing analytics, creating surveys, and coaching your representatives can take up time and manpower. Sage Advantage offers third party call monitoring with programs that are customized to each client’s needs. 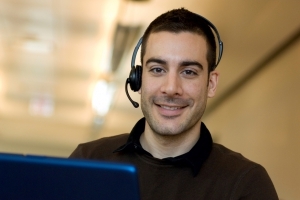 They work with you and provide you with high quality call monitoring. Sage Advantage, a third party call monitoring company, offers a variety of services and tools to help you improve your call center performance and deliver a superior customer service experience to those that call in. Sage Analytics is our proprietary system that we designed with you and your needs in mind. This SAAS system, or software as a service system, does not require the user to purchase software or hardware to use and is affordable to buy. Our analytics software provides the user with real-time information, technical support, quality reporting, and more, all in one, easy to navigate place. To give customers the best customer service experience possible, it is essential to get their feedback and know what they feel went well and what didn’t. It is also important for companies to know when the best time to get information from customers is and how to go about it. Third party call monitoring company Sage Advantage can help. Our survey products can help you gain valuable insight to customers, which can result in coaching opportunities, quick identification of problems, and more. The results of our survey products can be seen quickly, allowing you to take action when needed. They are both also conducted while the call is top of the mind, which can help ensure customers are giving more in depth feedback and honest feedback. Sage Advantage partners with you to meet your needs. Also check out Evaluate Quality, their online offerings. Offering a variety of third party call monitoring services and tools, we work with you so you can feel confident you are giving your customers the best customer service experience possible when they call in for help. With customized programs to meet your needs, we aim not just to meet your expectations but exceed them. Be sure to contact Sage Advantage today to learn more about what we do, or, to schedule a demo.